Wagging Tails = Happy Parents! Hello Jill - I hope this note will encourage others to give A’Dobe Angel a chance, because it can make all the difference in the world - If anything can help I truly believe it is your product. I will give 4 brief testimonies and would be glad to have them call me if that would help. (home #: 602-482-1104/ cell-689-1845). First, my two dogs: Shadow & Pirate. Shadow then 12-years old developed a digestive tract condition. Lost 15 or so pounds, was unable to eat and was so very weak and sickly. The vet was trying all sorts of expensive pills on her but she was not showing any improvement. The vet really didn't think Shadow was going to make it. Within 2 weeks of putting her on A’Dobe Angel, APA Antioxidant Booster, she was a different dog - her symptoms disappeared and she began to eat again and regained her strength, appetite and weight. That was about 7 months ago and she turned 13 in September - She is doing wonderfully - not only back to great health but acting even younger and perkier than before she became so ill. By the way, when I started the A’Dobe Angel even against the advice of my vet - I stopped all the medicines from the vet. Shadow's turn around surprised us all - really within 10 days I saw a different dog. I keep Shadow on a maintenance diet with the adobe angel and she is going strong! The vet comments on it every time she sees us that she can't believe it. 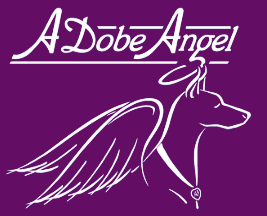 One of the girls in her office has an elderly dog that was just becoming very lethargic and sickly - they really couldn't diagnose anything specific but she has started the adobe angel and reports her dog is doing much better too. I will speak for my sister's dog as she rather has her hands full at this time. Her precious 5-year old Mastiff, Cleo, was diagnosis with both a colon cancer and bone cancer. Local major university vet clinic gave Cleo - 3 months to live. Laurie found your product and put Cleo on it and it is now almost a year and half later and Cleo is not totally cancer free but has been living a good life - she was extremely ill and now eats regularly, has maintained her weight and activity level. Is pain free and did not have to have her leg amputated. any better after months of continuing his medicinal routine. I put him on the APA Antioxidant Booster right after he finished a test product someone is trying to develop out here - it did not help him at all - his test scores didn't reduce at all. It has now been about 3 months and he is solely on ADobe Angel. APA Antioxidant Booster and he is doing great - his activity level and appetite have returned and he is finally putting some weight back on. He looks absolutely wonderful. I can't wait to take him in for another test but he is not due for another 2 months. But again everyone who sees him cannot believe the difference in him! Finally, a friend I work with confessed to me that their only 4-5 year old dog had become very sick - not able to eat and losing a lot of weight - they were considering putting the dog down and it was going to be so hard on their kids. They didn't have alot of money to have lots of tests run or try alot of different vet recommended treatments. I convinced her to just try APA Antioxidant Booster. Within two weeks the dog turned around and seems to be back to his old healthy self - they couldn't believe it. I know that is was developed primarily to treat cancer, but I find APA Antioxidant Booster to be working in many other situations - the immune support it gives to the animals seems to allow them to almost heal themselves - their own immune systems get healthy and not depleted and fight for themselves with amazing results. I am so grateful for this product - I recommend it whenever someone is faced with an ill animal. I plan to keep my Shadow on it forever - as she is going on 14 years old and going on very strong - no one can believe how good she looks and acts. I have all my 3 dogs on it! we ever thank you for the work you put into developing this product! Thank you - Thank you - Thank you - again and again! Always our love and appreciation! 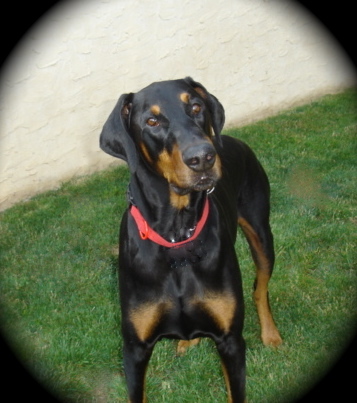 On 6/12/07, our handsome 6-year old Doberman, Buster, was diagnosed with a Fibrosarcoma in his neck. Let me tell you, I was devastated!!! My vet painted a grim picture and wanted us to see an oncoIogist vet. I went into a depression state for about two weeks. Then, I said to myself enough of this, I NEED TO FIGHT THIS!! I went online and research Buster’s cancer. That’s when I found you & Robert McDowell’s Herbal treatments. I emailed you regarding my boy and you responded within 10 mins. Then you called me on the phone and we spoke for about a 1hour. You made me feel much better about the whole situation. You gave me hope when I thought it was hopeless. I cannot tell you how that made me feel, that you took time out of your busy schedule to help a complete stranger. SO, I ordered the APA Immune Booster and the Maritime Pine Bark Extract right away. I started giving it to Buster and I also give it to his sister Brandi to strengthen her Immune system. I went to 2 different oncologist and they both painted a grim picture and wanted to start Buster on 4 rounds of Chemo. One of those oncologists told me that I should have never started a holistic approach and that I would have to stop it. She also told me that if I did not give Buster the chemo his cancer would return within 3-6 months and he would be worse. Then I found a holistic vet about an hour away and I took Buster to see him. He was very pleased that I had already started Buster on the APA & Maritime Pine Bark Extract. He added Chinese Herbs to his regimen that I already started. As of today 6/13/08, It now has been ONE YEAR that Buster had his Fibrosarcoma removed. As of today, it has not returned. We just went to his holistic vet yesterday and he is very pleased with the way Buster looks. He looks great!!! He is now up to 103 lbs. The vet told me yesterday that his cancer probably will not return. He said that it would have come back within the year. I am not changing a thing!!!! I will continue to give Buster his APA, Maritime Pine Bark Extract & the Chinese herbs from his holistic vet. I truly believe that all of these treatments helped my boy, and I am truly THANKFUL. We all proved the oncologist WRONG! THANKS for helping me & my boy!!!!! I was devastated and had NO HOPE until I found you!!!! I think other people need this info and know that THERE IS HOPE. If it wasn't for you, I do not know what I would have done!!! (now I have tears in my eyes) Buster thanks you too!!!! (SO does Brandi) I will never stop the APA, I firmly believe in it. Kisses to RCi in Heaven. Thank you Jill! You are AMAZING!!! 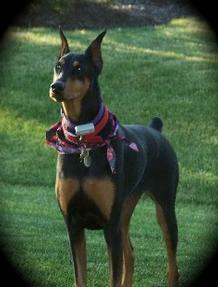 Hi Jill - Thanks so much for asking about Kali, my 7 year old dobie. She had surgery March of 2006 to have some masses in her mammaries removed, and it turned out to be adenocarcinoma. She was spayed at the same time (she had been a show dog so was still an intact female). She had always been a VERY active dog, and she slowed down quite a bit over last summer and fall- still playing ball, etc. but didn't have the same joyous energy. In March of this year, she developed a mass on her lip which looked like it could be mast cell, but luckily biopsy showed it was a benign follicle irritation. While in for that surgery, we did her routine follow-up chest x-ray, and there were suspicious lesions in her lungs. That's when we started her on your APA immune booster, and it didn't take long to notice an improvement. She is now back to having the energy of a puppy again, and we have gone from discussing possible chemotherapy and major surgery to going back to our agility classes with a dog that is having a wonderful time. In fact, we hope to take her to the DPCA Nationals in October to show in Veterans and hopefully agility. She is due to be going back for more x-rays and possible an ultrasound soon, but I am very hopeful about her future after seeing such an improvement with no other treatment than the APA immune booster. We want to thank you for giving us our silly happy active dog back! 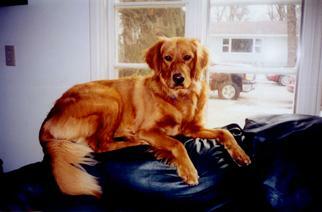 In March of 2007, our gentle, handsome 7-year old Golden Retriever, Titan, was diagnosed with a tumor in his chest. We initially took him to our Veterinarian because he appeared to be lethargic, slow moving, and appeared to be in pain of some sort. The Veterinarian took an X-ray of his spine because Golden Retrievers are prone to developing hip dysplasia and we thought that might be his problem. When the Vet looked at the X-ray he discovered his spine was deformed, but he also found a tumor in his chest cavity. He took a needle biopsy and told us it was of a serious nature and said we should consult an animal oncologist. We told ourselves there must be something else we can do for him and started researching different sites on the Internet for additional information about fibrosarcoma and its treatment. 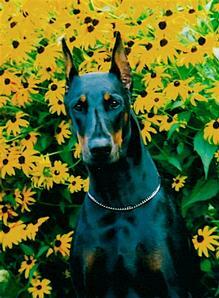 By chance, we came across the story of a brave Doberman Pinscher, named RCi, who had exactly the same type of cancer as our Titan. The story was so touching and moving, it gave us hope, and we immediately contacted Jill Spencer at A’Dobe Angel about RCi’s cancer treatment plan. Jill was so helpful and encouraging. She told us about the treatment regime they used for RCi and we proceeded to order the APA Immune Booster mix, the Maritime Pine Bark, and the Canine Cancer Treatment Serum. We are following the exact treatment plan they used for RCi. Today, (3 months into his treatment) Titan is back to his old self, jumping into the car, chasing squirrels in the back yard, taking daily romps in the park, and appears to be loving life! We know the day will come when this awful disease will finally take our sweet fur-kid (as Jill refers to them) but until that day comes, we will cherish every moment with our precious Titan. We are so happy to have come across the story of RCi, which has given us hope and encouragement during this difficult and challenging time. Thank you, Jill! Hey, I just wanted to let you know that we got our re-order of APA. Also, we got wonderful news this week. We had to take Murphy for a check-up and our vet says that he is back in remission!! They also did some blood work and it came back perfect, plus he had no abnormal lymphosites. Our vet and I were so excited. Our vet never thought that Murphy would be doing this well 2 months after coming out of remission. He even told us that we were proving the oncologists wrong. Now he is on prednisone once a day, but I truly think that all of the supplements are making the difference. I will have Mark (my husband) send you some pictures from our Spring Break trip to Gaitlinburg (he's better at the computer stuff than I am). We rented cabin and took Victoria and Murphy hiking in the mountains. Hi Jill, Thanks so much for your constant concern and caring about Lexus.She is not the same dog we had in March. Lexus had surgery in March 2007 and was very close to death. Dehydrated, anemic etc. She was in the hospital for several days after vomiting at least 5 times a day. Then they found the massive tumor on her lower intestines,it was the size of the doctor's two fists. When they went in to have it removed they called me and said they found more tumors through out her abdomen -- too many to remove and small but gave us no hope for her. They said she was terminal !!! My daughter found your site and I started Lexus on the APA. Well in just a few weeks we seen such a change in her. She recovered so fast from her surgery it was amazing. She had part of her colon out and part of her lower intestine removed. They were never able to name her cancer, but it was eating her up, so they say! Jill & I never gave up on her (Lexus). We decided to do chemo, APA and Herbal Treatments - Maritime Bark Cancer serum. Lexus is doing wonderful and back to her old self. By the way, she is only 4 yrs old so we were crushed !!! We just got the word two weeks ago, that she is cancer free, totally in REMISSION. I give a lot of credit to the APA because we seen the changes in from week to week. She has the sparkle in her eyes back. I look forward to her kisses everyday. She is a sweetheart !!!!! I will never stop the APA, I firmly believe in it. Kisses to RCi in Heaven. Thank you Jill!